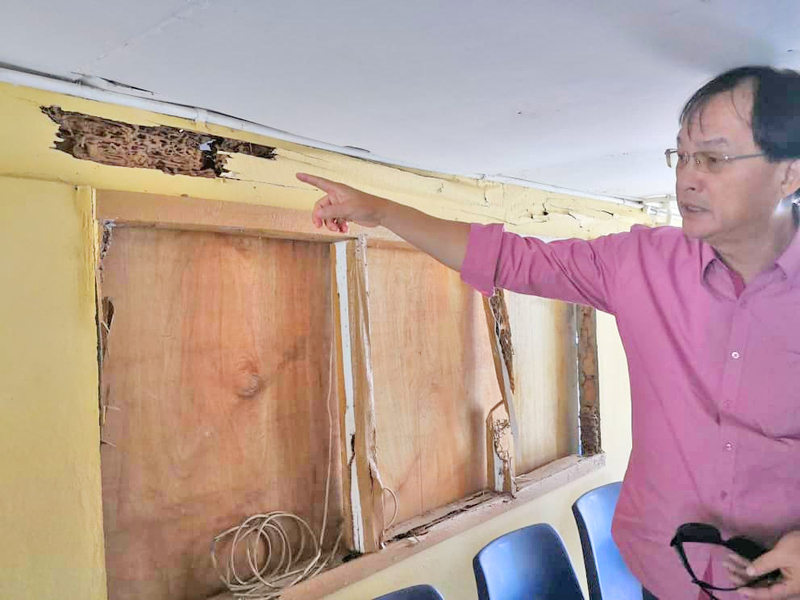 Baru Bian showing the beams eaten by termites at Long Sukang Hospital in Lawas. KUCHING: The Minister of Works and Member of Parliament for Selangau Baru Bian recently went on an official visit to Lawas pertaining to the issues affecting the locals there as well as in his constituency. In a press statement issued here yesterday, Baru said that the first order of business was to look into the delayed Lawas Hospital project. “I visited the site of the building project and had dialogues with officers from JKR Lawas and Limbang, and briefings by officers from KKR Limbang and Lawas, hospital staff including the Sarawak Director of Health Dr Jamilah Hashim. “The second dialogue session was with the District Office staff on the general development in Lawas, followed by a session with the PDRM on social issues such as drug abuse, illegal gambling and crime. “One unplanned event was an invitation by the Chung Hua School board for me to visit the school, at which they requested for a tar seal area to provide space for sporting activities and other events,” said Baru. He added that the most critical project that needed immediate action was the Lawas Hospital, of which the first phase and phase 2A have been completed. “What is left now is phase 2B, which is the building of the hospital structure. Besides Lawas Hospital, the Lawas Clinic and Long Sukang Clinic also needed urgent attention,” stressed Baru. The Lawas Hospital project commenced in 2011 with expected completion in 2016. The delay in completion of the hospital has caused much hardship to the people and even loss of loved ones. Patients in critical condition have to be sent to Kota Kinabalu or to Miri for treatment. Some of the people in Lawas do not have passports and cannot be sent by road to Miri as that involves crossing Brunei. Some patients who were sent to Kota Kinabalu reported being questioned why they had to be sent to another state for treatment. In extreme emergencies, the families can get a helicopter service, but the cost of that is RM7,000 per hour. At the moment, the Lawas hospital staff and patients have to put up with limited space in the rented shoplots and one old building that is used as a ward. The Lawas Clinic is also operating in a rented shoplot, while construction of the new premises is being carried out on a piece of land that was originally acquired for the Lawas Hospital. “I have to say that the most shocking and pathetic sight was the condition of the Long Sukang Hospital. It is obvious that the structure is unsafe – the beams have been eaten by termites, and some of the floorboards have been eaten through also. There are signs warning people not to step on certain portions of the floor in case the boards give way. “The building was built by the people of Long Sukang many years ago on land that belongs to the villagers. The land had been acquired for the clinic, but there has been no allocation. “The Rural Affairs Ministry had built a concrete structure next to the clinic which is being used as quarters for the staff and as storage for medical equipment. However the dilapidated building is still being used as the clinic, which serves around 1,000 people in Long Sukang and the surrounding villages. It is critical that a new clinic be built here as soon as possible,” said Baru. He concluded that in order to remedy the situation, a collaboration with the Ministry of Health and the Rural Development Ministry along with the Ministry of Works would be plausible. Baru Bian in Lawas to assess its needs 0 out of 5 based on 0 ratings. 0 user reviews.